Indianapolis, Indiana – Plaintiff Novembal USA, Inc. of Edison, New Jersey filed a patent infringement lawsuit in the Southern District of Indiana. Defendant is Closure Systems International, Inc., of Indianapolis, Indiana. Novembal is in the business of development, production and sale of products associated with the production, processing, packaging and distribution of food. 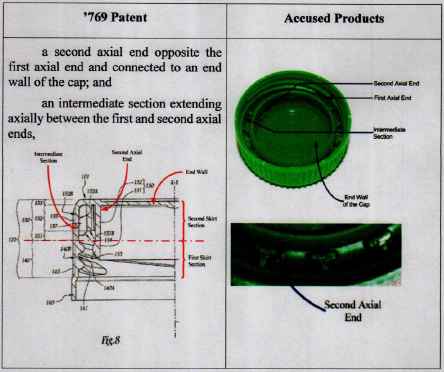 In this recent federal lawsuit, it has accused Closure Systems of infringing a patent covering bottle-cap products, which is entitled “Cap For A Container Neck.” This patent is protected by Patent No. 9,199,769 (the “‘769 patent”), which has been issued by the U.S. Patent and Trademark Office. Novembal contends that Closure Systems has infringed and continues to infringe, has contributed to the infringement of, or induced infringement of at least claims 1, 3, 10, 11, 12, 14, 16 of the ‘769 patent. Novembal further claims that Closure Systems’ infringement has been willful. Novembal seeks damages, including punitive damages, as well as injunctive relief, costs and attorneys’ fees. The lawsuit has been assigned to District Judge Sarah Evans Barker and Magistrate Judge Debra McVicker Lynch. It was filed in the Southern District as Case No. 1:16-cv-01184-SEB-DKL.